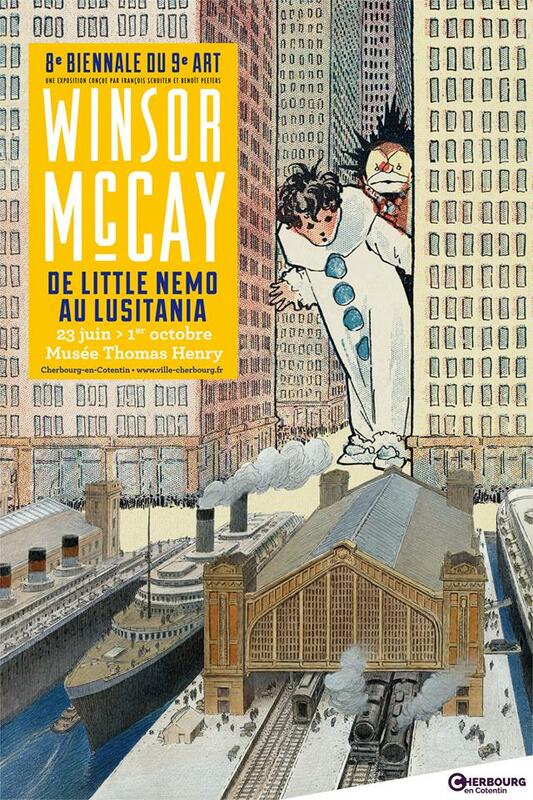 Winsor McCay: de Little Nemo au Lusitania is the exposition about Winsor McCay during the 8th Biennale du 9e art in Cherbourg. The exhibition is held from 23 June until October 1st, 2017 in Musée Thomas Henry in Cherbourg-en-Corentin. 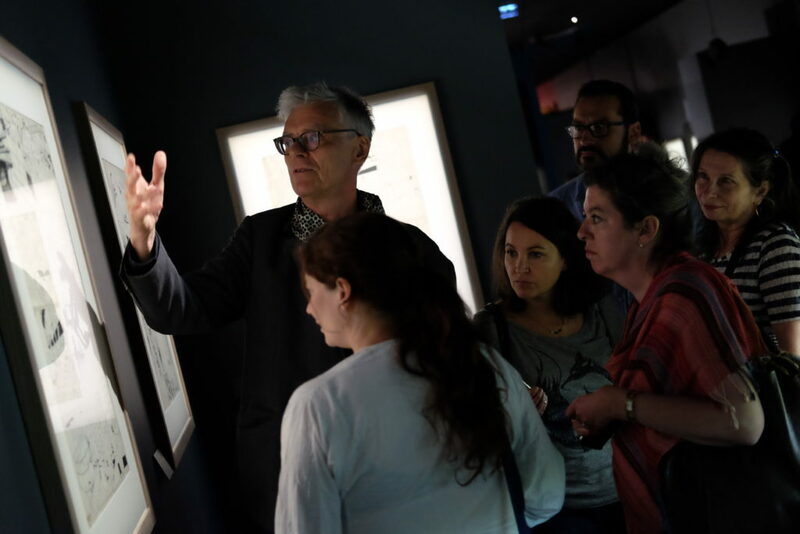 François Schuiten and Benoît Peeters are the curators of this exhibition in collaboration with Bernard Mahé. 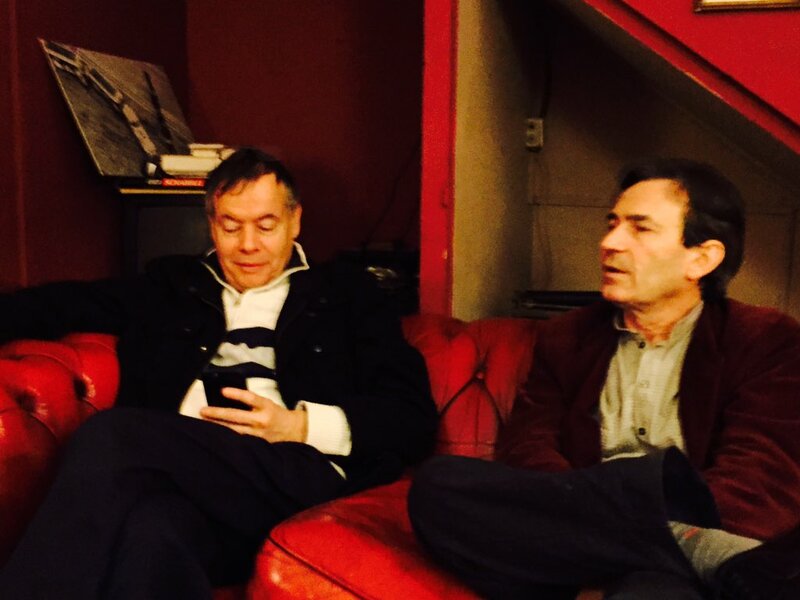 Bruno Letort is responsible for the music of the exhibition. 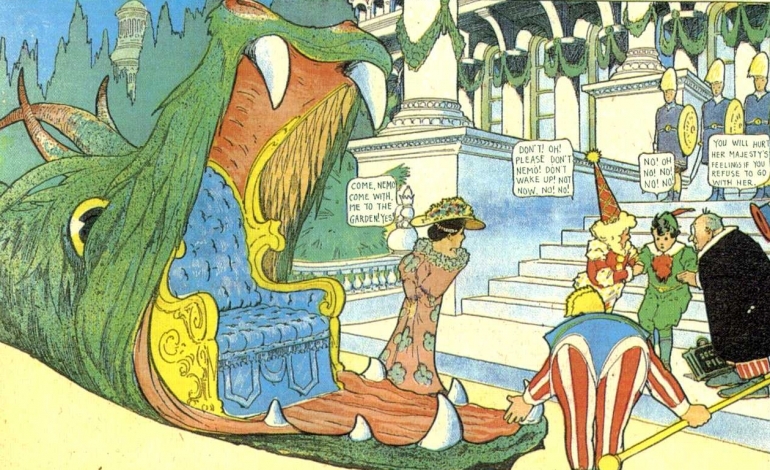 The exhibition includes excerpts from cartoons, but also about sixty original works, including thirty of Little Nemo. It is Bernard Mahé, Parisian gallerist, who convinced fifteen collectors to lend their works. “Jewels” that sell between 50,000 and 130,000 euros. Interview by Le Figaro 3) with François Schuiten about the exhibition. Photos by Bruno Letort 4), Quentin Guéroult 5), Thomas Clément 6) and Benoît Peeters 7). Vladimir Peeters made the following video giving an overview of the exhibition. 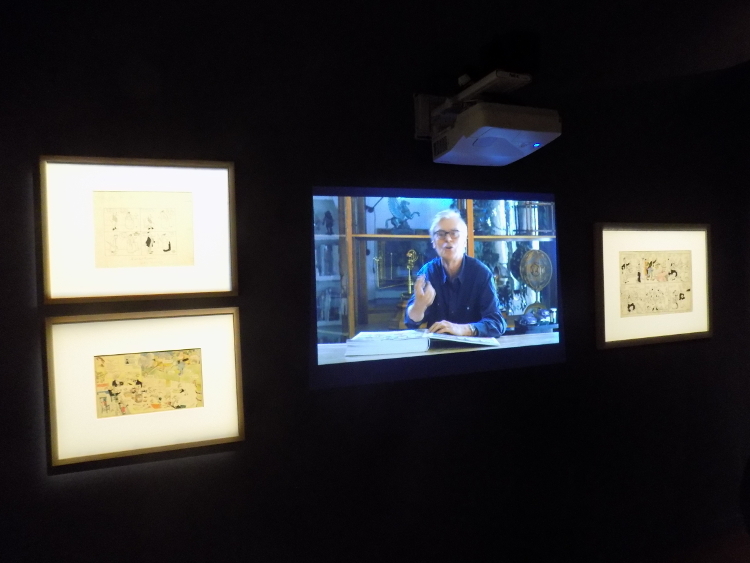 During the exhibition some videos were shown with Benoît Peeters and François Schuiten commenting on certain aspects of the work of Winsor McCay. 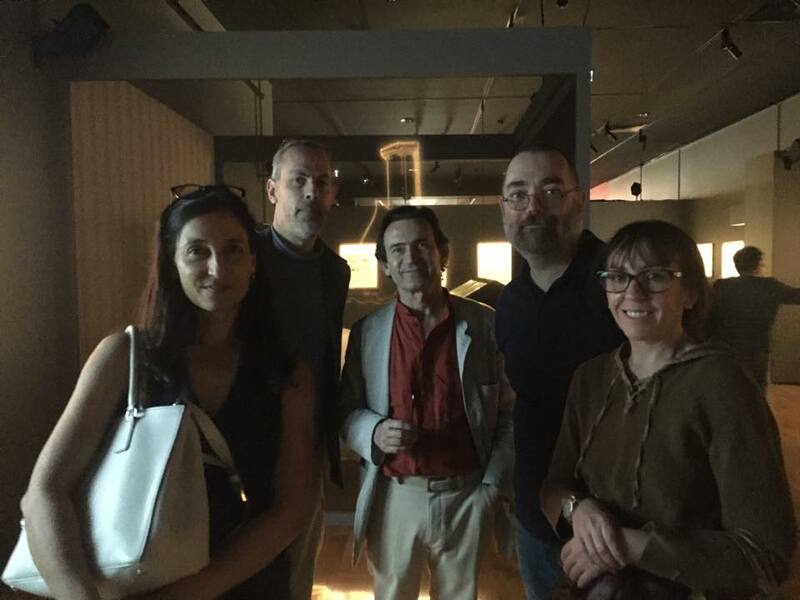 Benoit Peeters in company of Daria Schmitt, Valérie Mangin, Denis Bajram and Fabrice Neaud at the opening of the exposition Winsor McCay in Cherbourg. Photo by Martin Zeller 8). 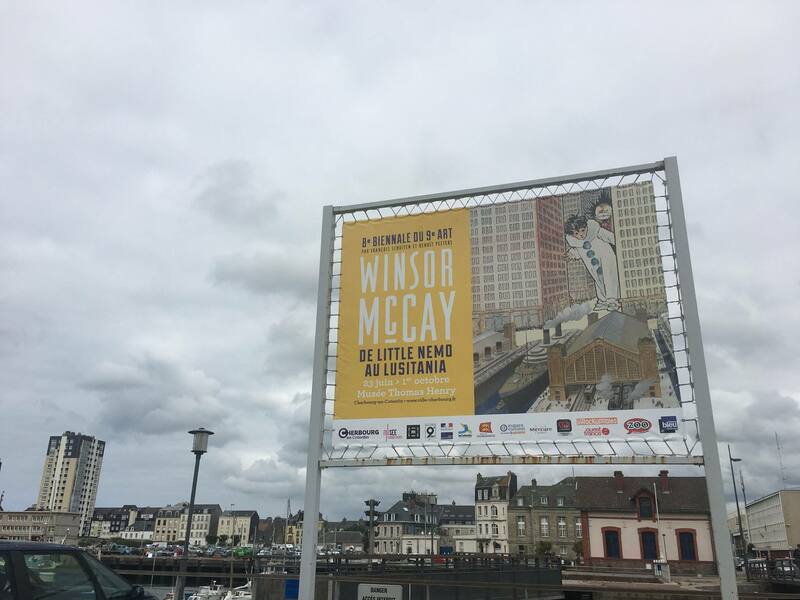 In May 2015 it was announced that the Biennale du 9e art of 2017 in Cherbourg will be dedicated to the work of Winsor McCay, the father of the American comics 9). “After 7 biennales devoted to European comics, the 2017 biennale will launch a USA cycle. We will explore the transatlantic imaginary links between Cherbourg and the Americas.”, according to Catherine Gentile, deputy mayor for culture 10). François Schuiten and Benoît Peeters will be the curators of this exhibition, in collaboration with Bernard Mahé. 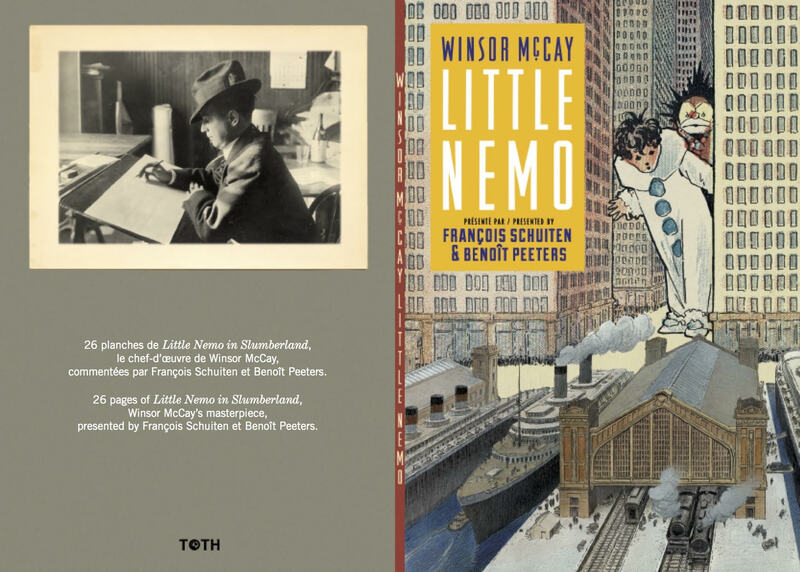 This is the first monographic exhibition devoted to Winsor McCay in a museum of Fine Arts in France. With Schuiten and Peeters to maneuver as curators, Biennale 2017 should be exceptional and explore all the dimensions of the work of McCay, “we will focus on modernity of the author and the multimedia aspects, we will trace some of the work from this designer cartoon and we will stage the context of his time, including the Chicago World Expo, that greatly influenced McCay … ”. 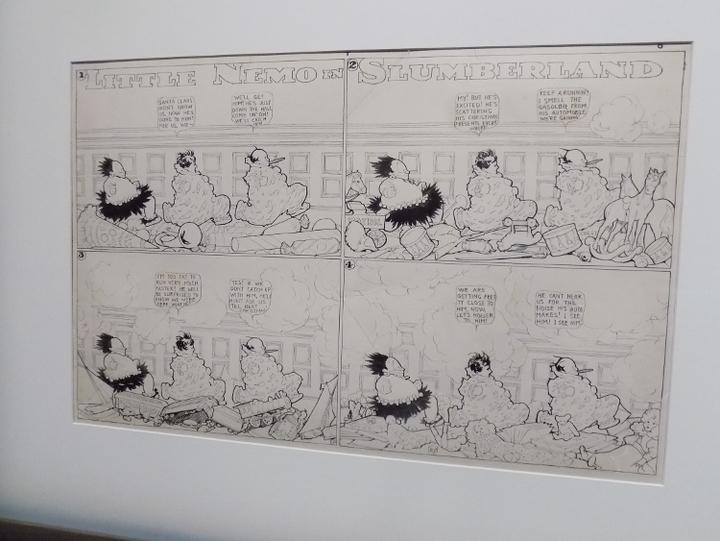 Visitors will discover original McCay lent by the gallery owner Bernard Mahé & film screenings. For the occasion lectures, screenings and meetings with authors will be organized 11). The exhibition is designed in partnership with the gallerist and collector Bernard Mahé: “We will present some fifty original drawings, often in black and white” 12). 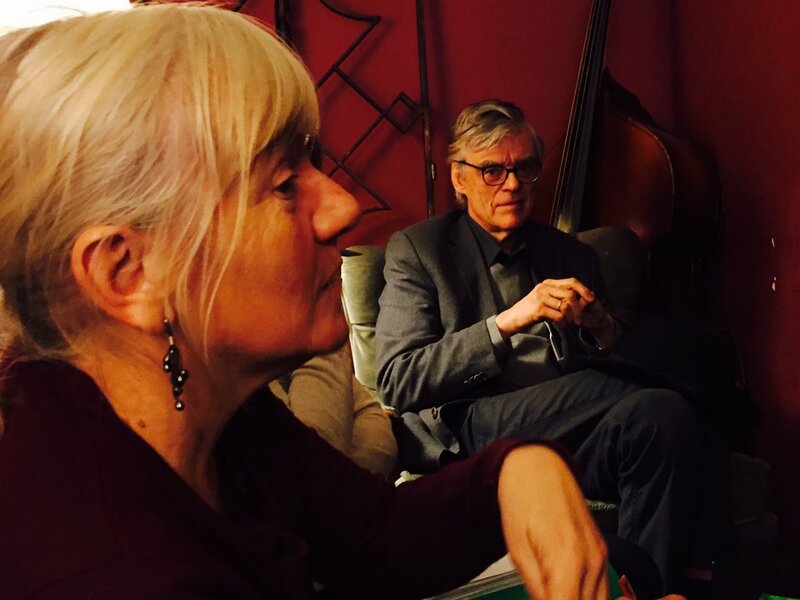 In February 2016 François Schuiten and Benoît Peeters met Florence Coudre, Catherine Gentile and Bernard Mahé for some discussions on the exhibition 14). On March 17, 2017 Benoît Peeters and François Schuiten gave a preview of the Winsor McCay expo in Galerie 9e Art 15). The announcement poster was released in December 2016 and it is a mixture of an image by McCay and Schuiten. As part of this event, 12 Atlantic published the Biennale poster in a limited print. The first version is a 80x60cm format on Modgliani paper. This version is signed and numbered. The other version is a 70x50cm format on paper Artic, not numbered or signed. A postcard is also published 17). Around the exhibition two books are published. The first book is a very large book: 64,20 x 49,2 cm, around 90% of the original page size. The book will have 26 original pages together with the coloured Sunday Pages versions. 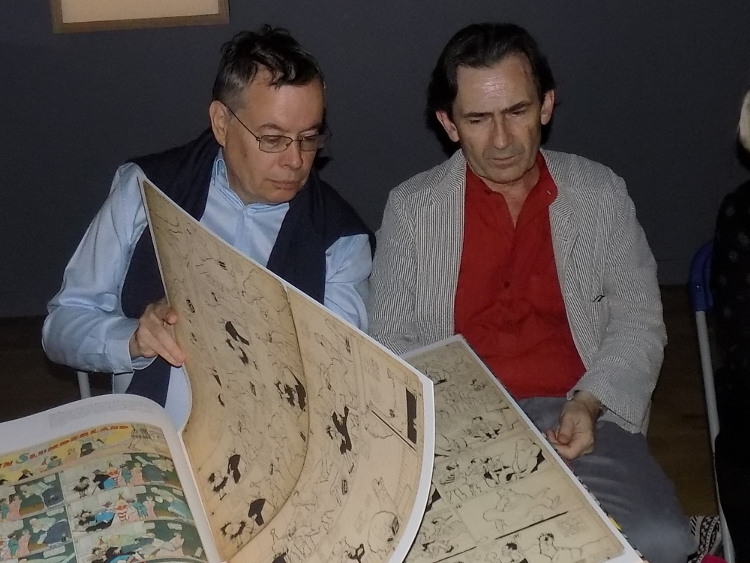 All pages are commented by François Schuiten and Benoît Peeters. This book wil cost 480 euros for the first 60 copies and 580 euros for the remaining 120 copies. All copies are numbered 18). The second book has 64 pages and is sized 14,5 by 21cm. 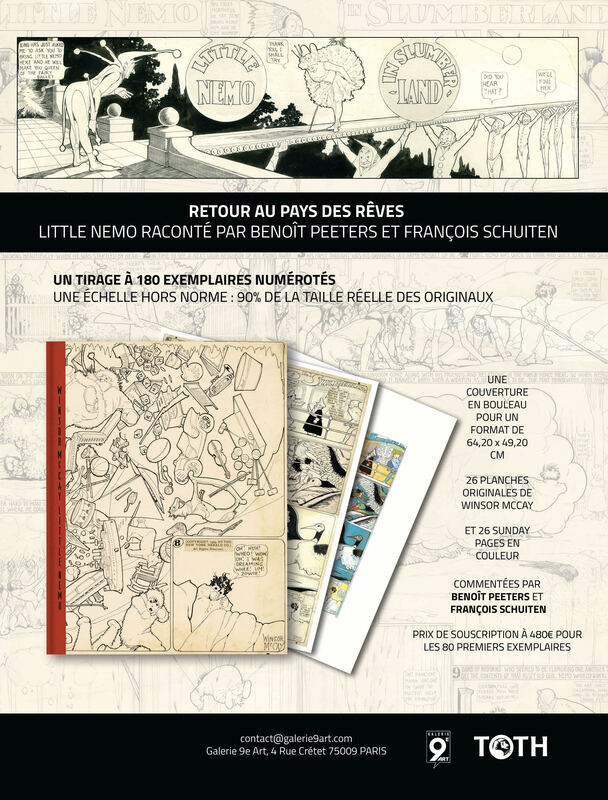 It has also the 26 original pages and commentary by François Schuiten and Benoît Peeters. All texts in this book will be in French and English. The costs will be 5 euros. Saturdays and Sundays: 1 pm-6pm. Closed on Mondays and public holidays. The Cherbourg tourism office published the following brochure 19).